The migration of business to the internet continues to give investors outsize rewards. These three growth companies may be just what your portfolio needs. Disruptive companies hold the promise of great stock-price growth. Here are three companies at the forefront of disruption within their respective industries that are worth a look: Ellie Mae, Inc. (NYSE:ELLI), Shopify, Inc. (NYSE:SHOP), and Zillow Group (NASDAQ:Z) (NASDAQ:ZG). Their revenues have been increasing and they hold the promise of ongoing success. Zillow Group, Shopify, and Ellie Mae annual revenue data by YCharts. Ellie Mae, Inc. is a software-as-a-service (SaaS) platform that offers automation infrastructure to the residential mortgage industry. Its Encompass product is an enterprise-level platform that gives mortgage companies a one-stop solution for all functions around originating a mortgage, including customer relationship management, loan processing, underwriting, document signing, funding, and closing a loan. In addition, the company offers the Ellie Mae Network, a proprietary electronic network that enables electronic business transactions to process and fund loans. The company's services are disrupting a highly fragmented and regulated industry that has relied on manual processes for most of its history. Image source: Ellie Mae fourth-quarter investor presentation.Ellie Mae Q4 investor presentation. The chart above shows that Ellie Mae has room to grow horizontally, by selling its service to more customers, and vertically, by offering a greater feature set for mortgage providers online. The key takeaway for investors is that the migration from offline paper-processed mortgages is under way. By investing in the industry's online leader, you put a company with a tremendous tailwind into your portfolio. Shopify creates space for businesses to sell their products online. Monthly subscription fees are in the sweet spot to help small companies get online at a reasonable cost. The more features a business wants, the higher the subscription price. Add payments processing and shipping logistics on top for an incremental transaction fee, and a business can be online across multiple platforms in no time. Shopify also takes care of businesses' brick-and-mortar needs with point-of-sale and inventory-management tools. It offers a completely integrated solution with a seamless environment for its customers. Shopify is a software powerhouse that in the most recent quarter reported 377,500 customers. That's a small fraction of the 10 million small and medium-sized businesses in its current "core" geographic market (North America, U.K., and Australia), which are spending upward of $12 billion for web-related and back-end services, and the estimated 46 billion estimated business in the global available market of small an medium-sized businesses. The company originally targeted small to medium-size businesses, but with the introduction of Shopify Plus it is now scaling to larger brands such as Tesla and General Electric. Zillow Group is the big gorilla in real estate e-commerce. In the most recent quarter, Zillow Group's brands received visits from over 140 million unique monthly users. Those types of numbers draw advertisers from across the real estate spectrum, including mortgage brokers, real estate agents, developers, property managers, and mortgage providers, who, according to estimates cited by Zillow, spent a combined total of $15 billion in advertising in 2016. 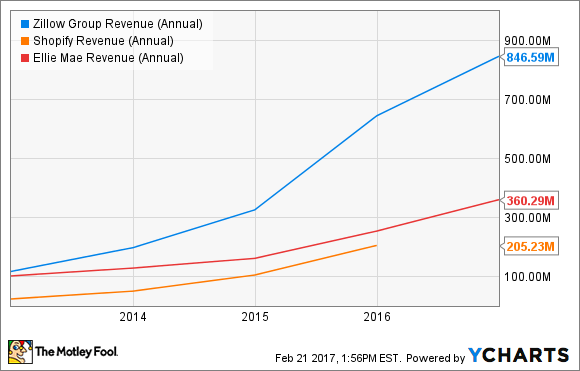 Compare this to Zillow Group's revenue of $846 million in 2016, which was up by 31% from the prior year. Zillow's ability to capture more revenue will depend on increasing the number of agents, contractors, and mortgage brokers it can attract to its platform. In addition, the company hopes to increase the amount of each customer's budget that is devoted to Zillow, as advertisers see a greater return on investment by acquiring more clients for their respective businesses. All three businesses are playing in industries that are being disrupted by the internet. All three have demonstrated the ability to execute based on their individual revenue growth for the past few years and all seem significantly undervalued in comparison to the overall opportunity in front of them. Trying to evaluate a growth company using a conventional metric like the price-to-earnings ratio can be difficult. Companies tend to spend early on in their life cycle to capture more growth by putting all the profits back into the business, making the P/E ratio meaningless as revenue doesn't make it to the bottom line. I find it more helpful to look at a company's enterprise value, which is what someone would have to pay to buy the entire company at today's market price. (Enterprise value is equal to the market cap of the company, minus its cash, plus its debt.) If it looks like the future opportunity for the company to grow is much bigger than the company's current enterprise value, there is a good chance the company's stock price will go up over time if the company can execute its plan and capture a bigger slice of the pie. 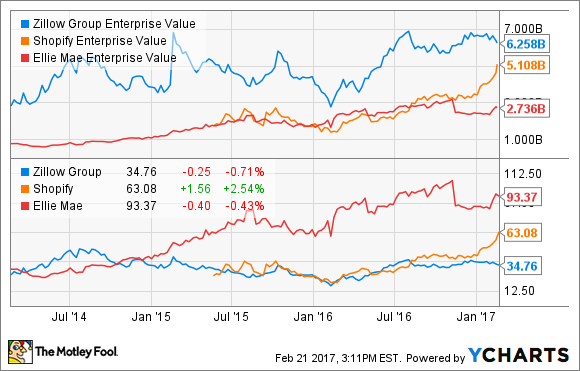 The chart below shows each company's stock price and enterprise value. To my eye, the enterprise value of each company is much smaller than the total available market that lies in front of them. Zillow Group, Shopify, and Ellie Mae enterprise value data by YCharts. Stock prices of growth companies can fluctuate wildly as the market tends to overreact to any piece of news. To be a successful growth investor, you have to be able to ride out the roller coaster ups and downs of the share price and keep focused on the future business opportunity for the company. As long as the company executes against its long-term game plan, as an investor I am comfortable to hold my position and ignore the day-to-day volatility.